The biggest festival of the year, ANUshthan, was organized by the student council of Anant National University from March 8-10, 2018. 90-year-old Balakrishna Doshi made the whole nation proud by bringing home the Pritzker Prize, Nobel equivalent in the field of architecture. He was conferred this award by world-renowned architects Zaha Hadid, Frank Gehry, IM Pei, and Shigeru Ban on March 7, 2018, for his numerous contributions as an architect, urban planner, teacher, and his tireless contributions to India and beyond. The 3-days festival commenced with a colourful holi-like inauguration ceremony with all students dancing to the beats of dhols in the courtyard. Day 1 began with an interesting talk by the renowned architect, Krishna Rao Jaisim, followed by glass mosaic and photography workshops, on-the-spot events, debate and sports events. The first day was concluded by a stand-up comedy show by The Comedy Factory. Day 2 began with an insightful lecture by the widely popular architect, Aishwarya Tipnis, on sustainable and environment-friendly spaces. Students then participated in workshops, quizzes and competitions held throughout the day. Later in the evening, DJ Night was organized for all students and members of AnantU. The last day featured a mega treasure hunt in the campus, followed by cultural night post sunset. Over 1,100 students from across programmes - architecture, design and fellowship - and other colleges participated in the cultural show and made it a huge success. The festival had attracted students from Nirma University, CEPT University and Kalol Institute, and sponsorships from 6 entities including Birla White and Avirat infrastructure. In a span of mere 3 days, 8 workshops were conducted with 40+ participants in each. ANUshthan 2018 was covered by News18 Gujarati and Times of India. On 13th March, 2018, the Film Club @ AnantU, in collaboration with the Nomad Cafe, Ahmedabad, had organised a community screening of the Indian documentary, the Unreserved (2017). The screening was followed by a Skype-discussion with its director, Mr. Samarth Mahajan. He enlightened all viewers on how Jagriti Yatra, an annual train journey, and a book by Mahatama Gandhi, Third Class in Indian Railways, inspired them to travel across the country in general compartment and make this narrative documentary. The innately idiomatic experiences captured in the film from passengers belonging to different demographic and sociocultural backgrounds successfully conveyed the prime message 'the purpose of each journey is different, yet each journey offers the hope of a better life, a better tomorrow'. A contest was organized post screening wherein winners got food and confectionary hampers as prizes. Hemplab, an initiative towards sustainable lifestyle, had set up stalls selling environmental friendly stationery items, bags, cakes and cookies. 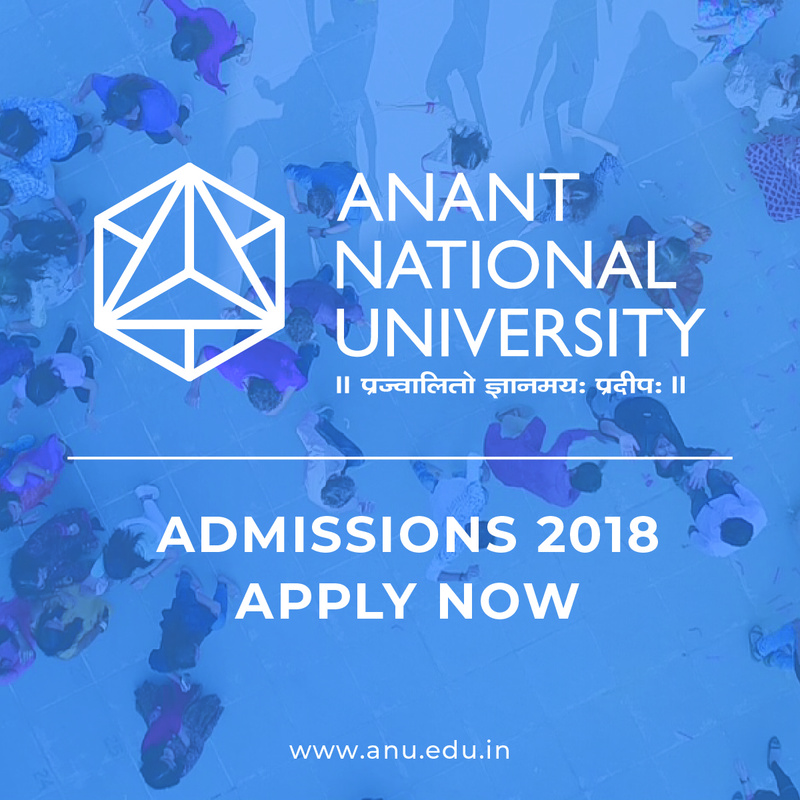 Anant National University is calling in applicants for Bachelor of Design programme 2018-19. 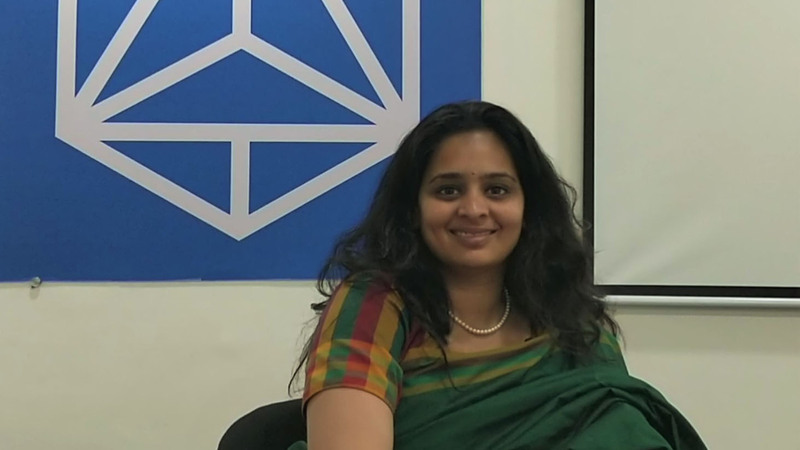 Miniya Chatterji, Founder and CEO of Sustain Labs Paris, a sustainability incubator for corporates, and former Chief Sustainability Officer at the Jindal Steel and Power Group of Companies, joins Anant National University as visiting faculty. 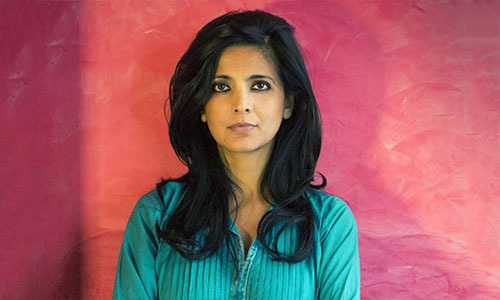 She recently launched her first book, Indian Instincts, a philosophical take on India, its residents and the role ubiquitous institutions, like government and religion, play in shaping their lives. On Sustain Labs' partnership with Anant National University, Miniya Chatterji said, "Working with AnantU gives Sustain Labs the unique opportunity to embed the values and techniques of building sustainable habitats amongst the next generation of leading architects and urban planners in India. It is truly visionary that AnantU envisages sustainability to be at the core of their pedagogy for all its students, and Sustain Labs is glad to be a partner in the fruition of that vision." Nidhi Goyal, Associate Dean - External Engagement, Anant National University, expressed her delight saying, "This partnership will strengthen our efforts to make sustainability an integral part of our coursework and culture. AnantU students will benefit from the expertise of Dr. Miniya Chatterji in the classroom and in their projects." 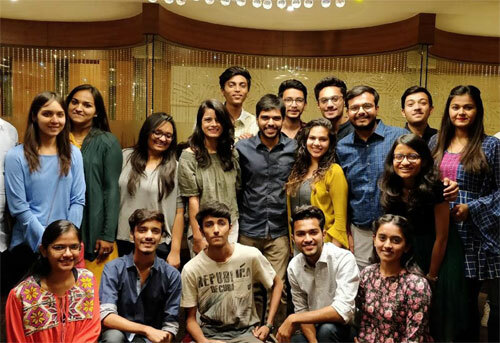 For their Live Action Project in education, five Anant Fellows - Aayush Makharia, Jinal Doshi, Joseph Assir Rajni, Sonam Gurmet and Harshil Parekh - received funding of Rs. 50,000 under Teach A Class programme to enhance learning of students of Virpura government school by setting up for them Zaya School WiFi, a device with pre-loaded content aligned to the CBSE board. 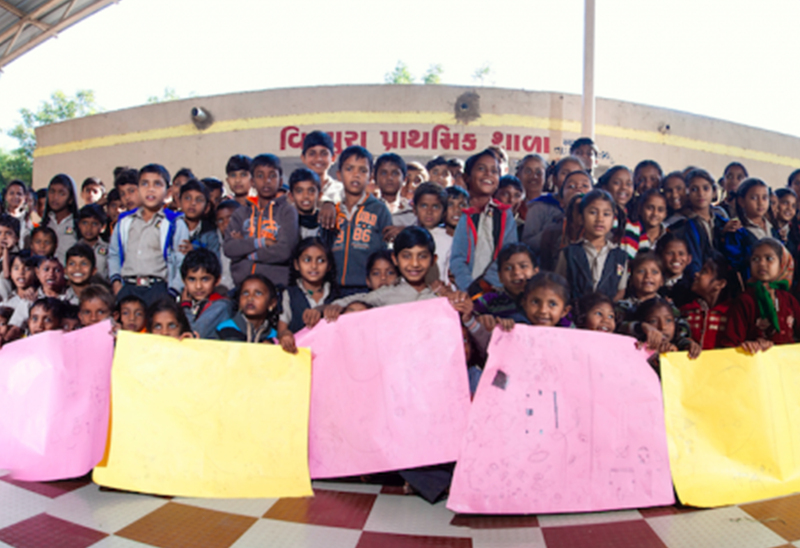 Through the Virpura School Project, Anant Fellows aim to create a digital ecosystem in the school that will enable its students to enhance their learning and have access to a world of educational resources. A major component of this project will include teacher training through online resources. The mission and vision of this project come under the umbrella of the Government of India's - Digital India Policy. 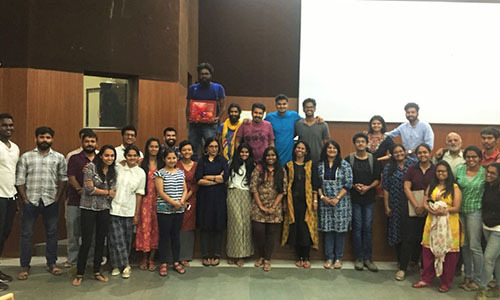 As a part of AnantU's annual festival, ANUsthan 2018, a workshop was conducted for UG students on the subtle art of storytelling. As humans who are largely driven by the visual sense, utilising this sense in a sensible way was the aim of this module. Key highlights of this programme included using photography as a medium in order to make compelling narratives and expending a strong narrative from the right number of photographs. Students were introduced to the fundamentals of photography around composition, lighting, materials and processes and then sent out to shoot around the campus. The images were then reviewed and feedback was given. The group further proceeded to read through images and understand the photographer's personality, and his mood and state of mind was extracted through metaphor elicitation. This workshop was conducted by Archit, Joseph and Jinal from the university's fellowship programme. 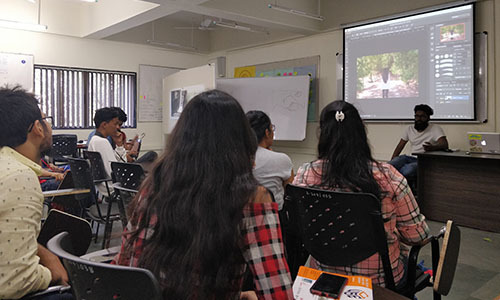 The workshop on storytelling was a lean experiment in the direction of many more to come, where students within Anant National University will share their knowledge and experiences amongst the community members. These workshops are a part of 'Collaboration Space' programme, an initiative by the AnantU Live Action Project team. 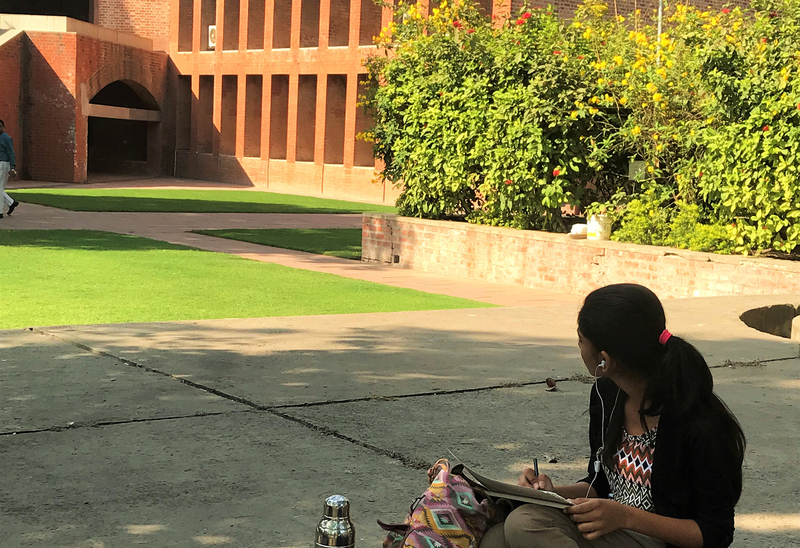 Students of School of Design visited Indian Institute of Management - Ahmedabad to study the interplay of light and shadow within brick structures and nature. They replicated these sights on their sheets and screen by sketching and photography respectively. Students explored colour as a medium and various techniques in the process. On 16th March, 2018, undergraduate students of School of Design were taken to Sabarmati Ashram in Ahmedabad. 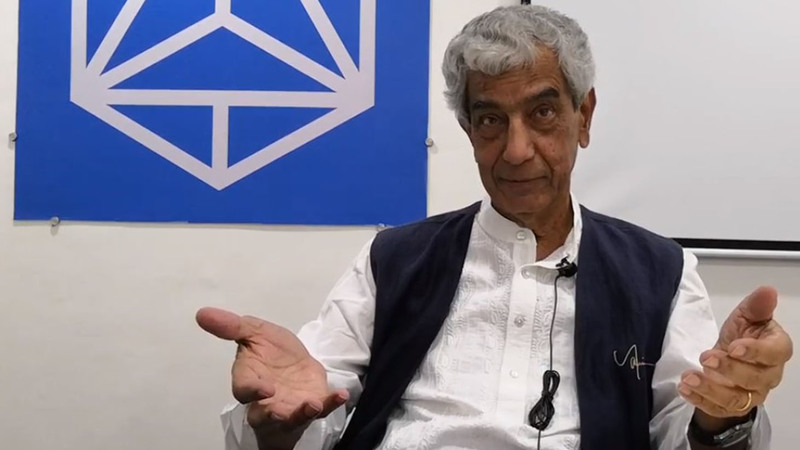 They observed how the Gandhi memorial museum was designed by Charles Correa and took inspiration on how human and nature can connect through structures. Students experienced sketching in new, warm and peaceful environment. 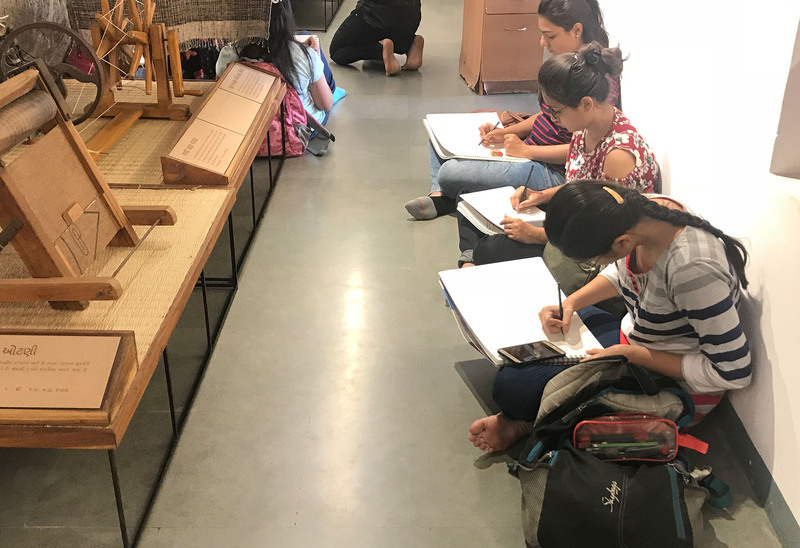 Students also studied 'Charkho' (spinning wheel), the tool and symbol of the Indian independence movement, to understand its joinery and functioning. They documented various types of charkhas with their sketches during the visit. 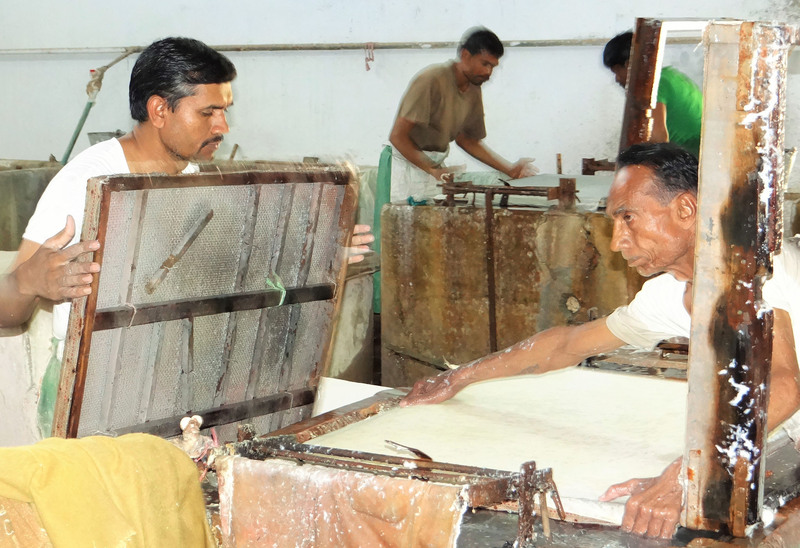 Founded by Mahatama Gandhi on the principles of self-sustainability and self-reliance, Kalamkhush is the sole khadi paper manufacturing and retail outlet in Gujarat. Design students visited Kalamkhush on 16th March to understand and document how tons of waste cotton is transformed into paper without the use of any chemicals in the process. Learning in students is enhanced when they are exposed to multiple methodologies that can be used for similar tasks. It is further strengthened when these practices are immersive in nature and require their active involvement. A practical exposure to different materials and finishes used in the industry was provided to second year students of Interior Design at AnantU. 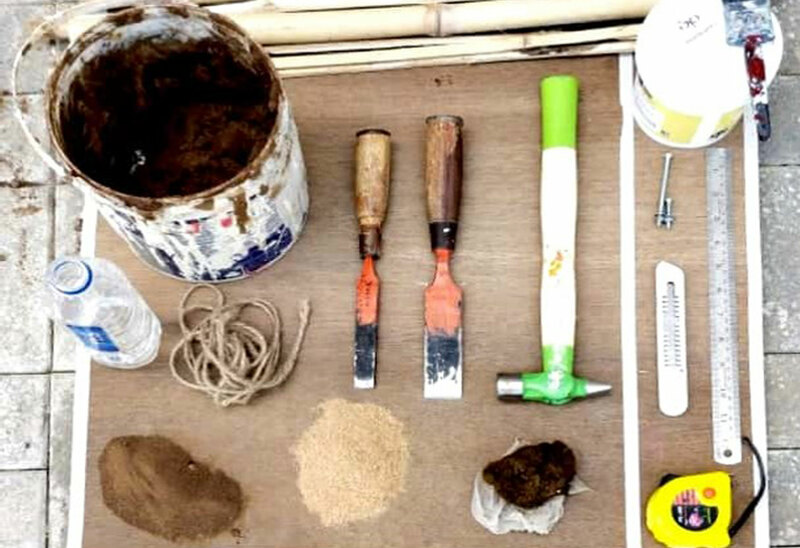 They explored materials used for finishes in walls, floors and roofs like bricks, stones, bamboo, wood and wood finishes, Mangalore tiles, concrete, plaster and paint. The visit was conducted in context of the theoretical lessons learnt by students under the guidance of Yesha Gajjar & Neha Vin for their course in Material & Construction. "You (students) don't have to design a building, a particular functional form of building, but if you can design between space and time, you've got a great future. And that is the potential I see here." On women architects, he said, "Women are going to show the new direction, not men; all big Indian architects are influenced by western architecture, but now a new wave of architecture is coming in India. Women have a lot of empathy, so they're better designers"
"We (women) are always trying to make ourselves special by saying that we're women; we should just believe that we're equal to men. If we don't believe it and keep asking for privileges, we have lost the gender parity game. So I think we're as good or maybe even better than men. Our work should speak for itself and we don't need to ask them for special privileges. We don't need one women's day; every day is a women's day for us." On AnantU's annual festival, she said, "I think there's a huge amount of talent & ANUshthan as an event is a great opportunity for students to interact with other people; it's a great initiative." BV Doshi's brilliant designs of Amdavad ni gufa, campuses of CEPT and IIM Bangalore, and Aranya Low Cost Housing township have stunned the world. His work has never been about the superficial glitz and glamour, but rooted in nature. Neelkanth Chhaya, a celebrated architect and former dean of the faculty of architecture at CEPT University, reaffirmed about the founder of CEPT University, "Doshi does not wear the garb of a superhero. His works have been to make others more expressive. His contribution to the world is unique� his architecture is about relationships of human being to other human beings and to nature�and he has demonstrated how this combination can revitalize the frozen way of looking at architecture". Anant National University, school to over 400 Architecture students, would like all future architects of India to remember these words by BV Doshi, "Indian architecture is connected to nature as well as sustainability and is humane is character. In our culture we talk about relationships, sharing, compassion and aspirations but of higher order which has an impact on larger percentage of society. So we can ask questions that are we really following any of these, either partially or fully and are we really trying to achieve this with the kind of technologies we have now and will be available tomorrow? Can our people spend less time in commuting? Can they spend more time with their families? Will there be a way to cultivate by spirit and body within natural, quiet and nourishing surroundings?" When a woman and man collaborate, they create new life. However, this spirit of collaboration hasn't really become a core value for organisations and government alike. During my undergraduate experience, competition was rewarded whereas collaboration was considered as 'cheating'. 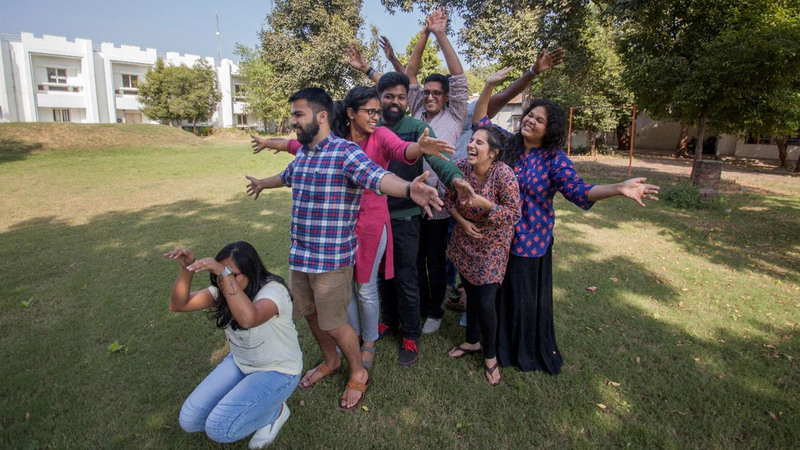 But after having spent just a few months in the Anant Fellowship, I realised how this incentive system was promoting friction rather than harmony. Because the approach to view things is extremely different here. Our cohort may not like each other, may fight for trivial things just like a family, but we stand united on a thread of 'collaboration'. When it comes to working together or helping someone out, we set aside our differences and contribute through the multiple lenses that we bring to the table to solve the problem. A typical day in the fellowship for me is nothing short of an adventure. I start my day by going for a walk in the campus, accompanied with a Christian from Madras and a Gujju from Bombay, where we spend some time reflecting on our life while admiring the biodiversity that surrounds us. By the time we step into our lecture rooms, I sit beside a writer from Pune with whom I usually gossip about how good or bad this module is turning out to be. On some rare evenings I decide to cycle back to the hostel while singing old Hindi movie songs accompanied with a historian from Ladakh who writes heart-warming poetry. Post dinner, I have this ritual of playing a table tennis match with an expert on sustainability from Ghana. Whosoever loses the match, ends up sponsoring the other person's ice cream (I've gained a lot of weight recently). By the time I'm about to call it a day, my roommate, who is a mechanical engineer from Hyderabad, is curious to share and exchange the experiences that we witnessed during the day. When I first met him, I almost dreaded the thought of living with him, but as we started to have more conversations and sharing our insights, we realised how similar we are. I soon realised this baggage of judgement and apprehension I carried, was because of my past experiences. This dates to my working experience in a multi-national architecture consultancy in Delhi. The process of completing a task, rested on various teams, across various departments and across various countries, but all of it happened in decentralised silos. The communication between the departments was limited. Collaboration was taking place amongst the same group of people, who belonged to the same school of thought and usually came up with similar solutions. This may have helped in achieving efficiency in terms of time, but how far can this approach go in terms of solving complex and unprecedented problems of the built environment? An orchestra is a collaboration of multiple people and instruments coming together to create harmony. New age co-working and co-living spaces like 'Roam' is an example of creating spaces where people come together from diverse backgrounds to socialize, network and learn from each other. Much like Anant Fellowship. Large furniture corporation like IKEA is now collaborating with niche designers like Ilse Crawford to redesign the experience of people visiting their stores. She puts in a beautiful way, 'The best results are always with collaboration and contrast". Solar Impulse, a solar powered aircraft to move towards a sustainable means of transportation. It is a collaborative effort of Omega, Schindler and Deutsche Bank. To fund this initiative, they started a crowdfunding 'Supporters Program'. Harvard and MIT, came together to start an online learning platform, 'edX'. A collaboration between the so-called competitors. Social media is another industry which has vastly benefited through collaboration. We get access to a whole new world, which physically seems quite far to reach daily. A few fellows in my cohort have already collaborated to start a company which provides personalized desk solutions through art. Another fellow and me are also collaborating to form an online media company through the medium of comics. This new-found zeal amongst the fellows to come together and work on something they share a vision towards is an accomplishment of the fellowship. The space has rendered us the freedom to unlearn the social institutionalisation that raised a barrier in front of our will. Research shows that as infants, we are intuitively collaborative, but this gets lost due to age old education and organisation structures. The fellowship has empowered us to question the status quo and thus, while some of us might join existing organisations and reinvent the wheel there, others might end up setting up their own organisation where collaboration is rejoiced as a core value. Each and every fellow in the program is unique, this uniqueness is valued and appreciated in our environment which aids the process of collaboration and not of judgement. As part of my Live Action Project, I'm collaborating with a visual artist and a strategic designer from the fellowship to design a physical collaborative learning model, if successful, can be tested as a pilot for other institutions to mirror and test out. To explain what I did with roughly 1000 words, Steve Lacy managed to put across through a sentence - "I think it is in collaboration that the nature of art is revealed." Did we even know about him until he died? I know most of us would have said 'no', then why did all suddenly started posting on social media about him? Is it because they actually cared or they were doing it because others did. Don't worry I also belong to the latter group. But the catch lies here, what did you take out of this viral news? Exposure about reach through social medium? For me it was the last one. Does anything only matter after it is extinct. Why are humans wired this way, wherein they value and care for things after they have exhausted the entire resource and lost it forever? It's really astonishing to know that extinction starts at very moment when you just think about you, your actions & reactions to yourself and not the mother earth who you exploit every day. Extinction is like breathing, you remember till you breathe in and forget about it while you exhale because you don't spend energy on it. (insight from an information from book gut by Guilia Enders). Hence, crying over spilt milk is not the solution but CREATING AWARENESS about it is the need of the hour. It is stressful if we feed on the medium over the message. Hence, going layers deeper to understand what and why it happened in the first place would be idealistic. Sudan died due to Age-related complication, and not sudden. He was ailing from muscle and bone deterioration and extensive skin wounds. But, why we just concentrated on Sudan when we didn't care about Suni who died in 2014 possibly from a heart attack. Both Sudan and Suni were likely too old to be fertile by the time they were brought to the Ol Pejeta Conservancy in Kenya from a zoo in the Czech Republic in 2009. The second-to-last male in the world was Angalifu, who lived at the San Diego Zoo Safari Park who died on 14 December 2014. Angalifu was beyond breeding age, leaving Sudan as the only fertile male in the world even when Angalifu was alive. Hence, Sudan spent the last years of his life under 24-hour protection from armed guards. His horn had been chopped off to deter poachers, though it had begun to grow back. His guards regularly foiled poaching attacks. But the effort to save the northern white rhino seemed to have come too late for a real turnaround. In February 2015, Ol Pejeta had launched a GoFundMe campaign to raise funds for the rangers guarding the rhinos. In May 2015, after contacting Ol Pejeta, Dubai-based Pakistani entrepreneurs Hamid Hussain and Muhammad Yaqoob had started a global campaign to create awareness and bring people to Ol Pejeta to help in generating revenues for the IVF treatments and other forms of assisted reproduction by inviting celebrities to visit Ol Pejeta. Among the celebrities who visited Sudan were actors Nargis Fakhri and Khaled Abol Naga. In 2017, Ol Pejeta Conservancy teamed up with Tinder and Ogilvy Africa to launch a fundraising campaign in order to recover the species. They created a Tinder account for Sudan, 'the last standing male of northern white rhinos', and the app's users could swipe right to make their donations for the development of breeding methods. So just imagine how Sudan was on social media all the time but none of us paid heed to it until he is no more? Why did we wait till the last one to suffocate him with constant guarding to protect extinction? Age is a factor for animals as well as humans to leave this earth. Medicines do help to prolong death but with pain either internal or external. Also, as much as we cared for Sudan are we going to care for both, his granddaughter Fatu through his daughter Najin. The last option to save the species is IVF is what we are trying for but why now? If the male naturally couldn't conceive meant something, which is maybe they knew it's time for the species to go extinct because they can't further adapt to fit in this world with restrictions and protection over them. It is only the human nature to keep the legacy going on through males. Even with two female white rhinoceros still alive we have claimed that the species is going to come to an end soon. With 27-year-old Najin and her 17-year-old daughter Fatu we still have 30 years hope left if they age and die naturally. But like humans we are going into IVF and other technologies which would decrease their span of life due to artificial meds that body wouldn't adapt to. This humans lens is not what we need to put on animals. They need language of love, through natural habitat and not humans with guns around them to de-risk poaching. Is this going to be the Built Environment we scaling higher and higher? What is the ROI (return on investment) in terms of Sustainability? Are we investing in order to pay higher prices later, which is EXTINCTION of entire species than just male species? We need to come with better solutions to tackle this not yet extinct white rhino species from getting disappearing soon. We still have time to change the built environment and provide love to these strong females Najin and Fatu to let Sudan be proud of. So let's just not stop at the medium of the message through social media. Keeping in mind Extinction just as a word, is a huge failed responsibility on humans only from human lens. Animals are trying to protect their species by not making them suffer with extreme adaptability in the current environment. 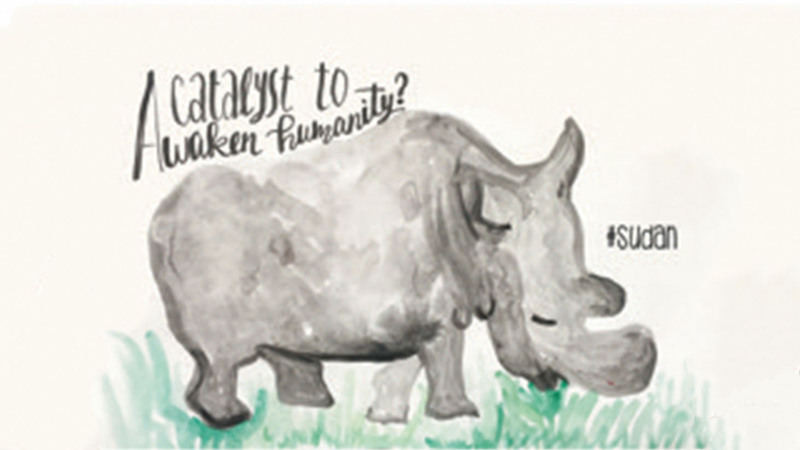 Hence, in my introspection it's not them but us and our perspectives about extinction and care need to change. "You must be the change you wish to see in the world", where Mahatma Gandhi rightly speaks of starting from oneself first and then moving onto our perspectives for built environment and then the actual built environment. It's time to think about revolutionary ideas to be a true Solutionary. this is the time where Sudan is like a catalyst to awaken the remaining humanity we have in our head heart hand and soul how much ever left. Let's march and build a sustainable collaborative environment which is liberal and free flowing.